A Direct Care Worker also known as the personal care assistant or caregiver is a support person who will render assistance to people who are sick, injured, mentally unstable or elderly or fragile. 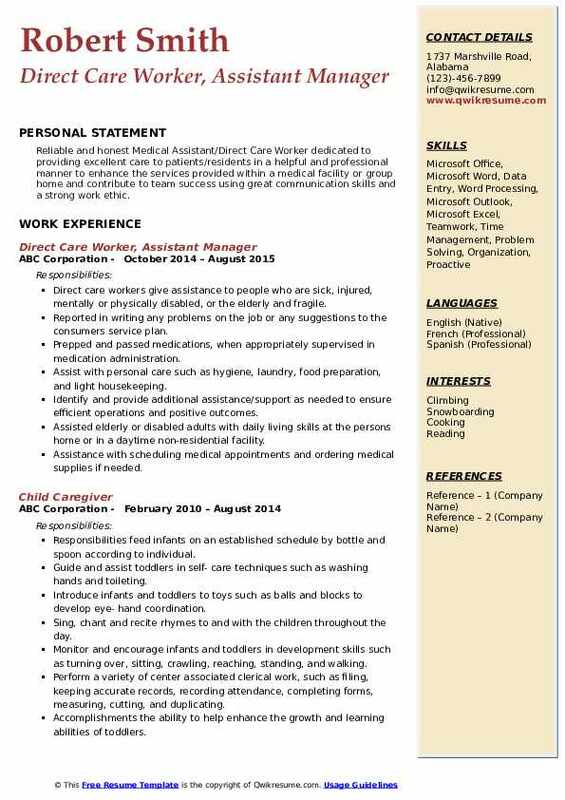 The most common duties and tasks that are listed on the Direct Care Worker Resume include – preparing and serving meals, making beds, administering treatments, handling laundries, buying groceries, observing patient progress and changes, running errands, helping in taking them to doctors, providing or arranging transportation, and serving as a companion to the patient. 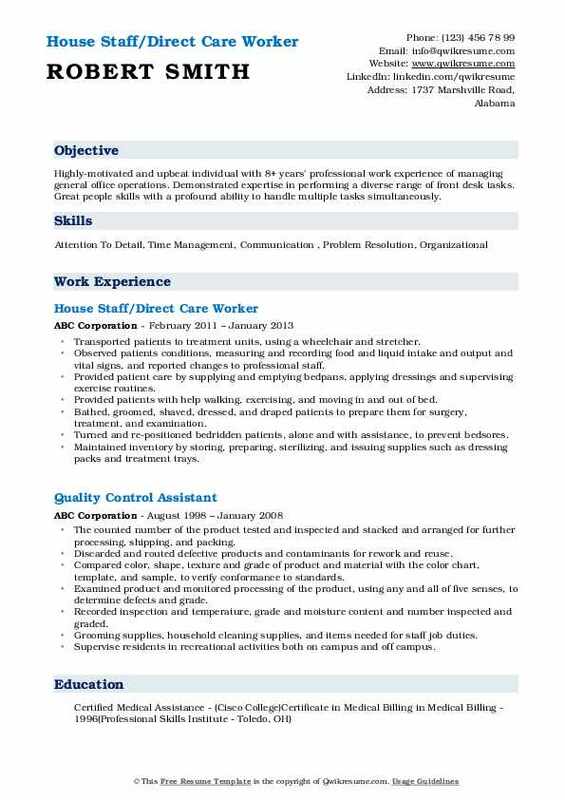 A well-drafted resume emphasizes on skills such as – physical stamina and fitness, the ability to do light household tasks and lift weights; strong interpersonal and communication skills, organizational skills, being sympathetic and understanding; and strong time management skills. As an education requirement, employers need only a high school diploma and basic math knowledge. Training is given on the job by other nurses or caregivers. Objective : Well-equipped to provide emotional support in a comfortable, soothing environment. 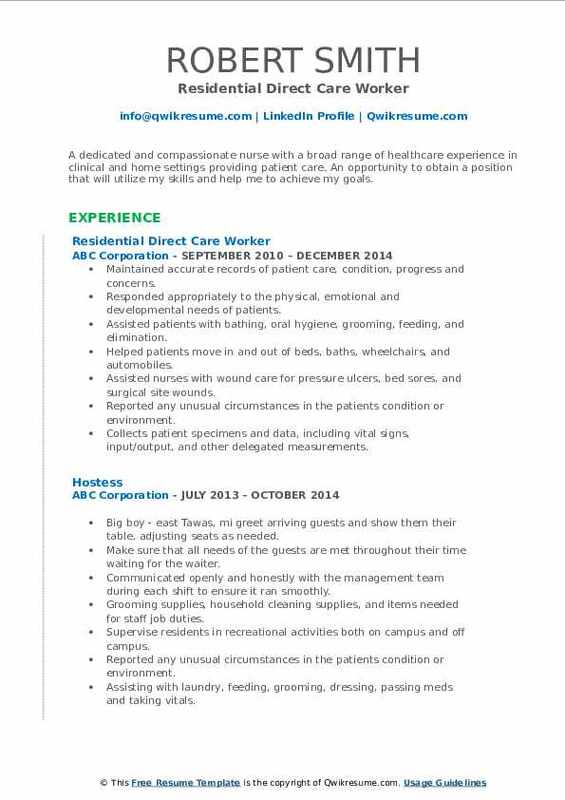 Desires a CNA position with training in a long term care or rehabilitation facility. Enthusiastic with excellent people skills and dedicated work ethic. 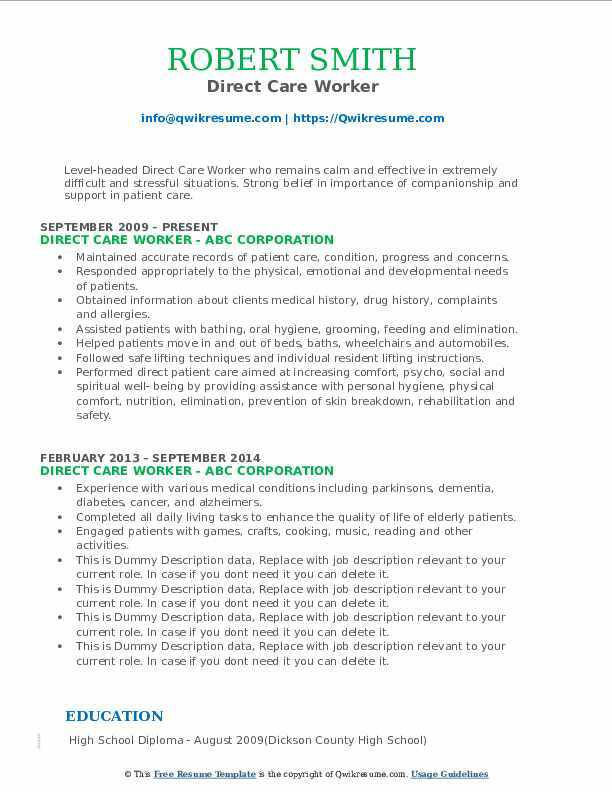 Demonstrated medical procedure competency. Experienced with strong clinical and people skills and experience in healthcare. Assisted patients with bathing, oral hygiene, grooming, feeding, and elimination. Helped patients move in and out of beds, baths, wheelchairs, and automobiles. Reported any unusual circumstances in the patient's condition or the environment. Maintain a clean and safe environment for consumers who are in the care of the agency. Objective : Highly trained Medical Assistant with Strong clinical abilities and a successful career in both hospital and Doctor Office setting facilities. Proactive and organized with passionate commitment to first-rate patient care. Also, wanting to get back in my passion as a Medical Assistant and helping others. 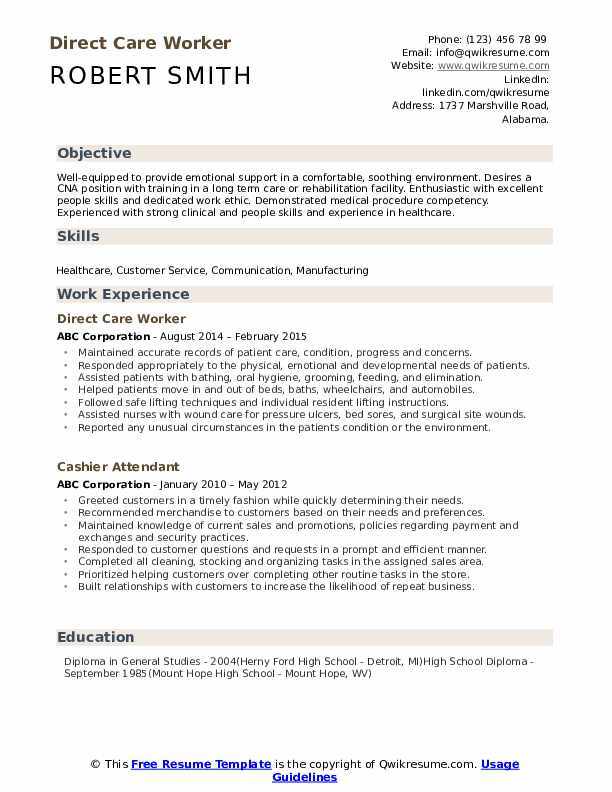 Skills : Adding Machine, Copier, Inventory Counting, Adept In Filing,computer Literate. Correct unacceptable behavior and help residents meet the necessary requirements of the house rules. Daily care and one on one interaction of elderly residents such as bathing, feeding, dressing, and daily exercise. Report patients progress using excel and Microsoft word with email updates. Helping disabled older adults with their personal care in a group home setting. Provided bedside, personal care, and related health care tasks as directed. 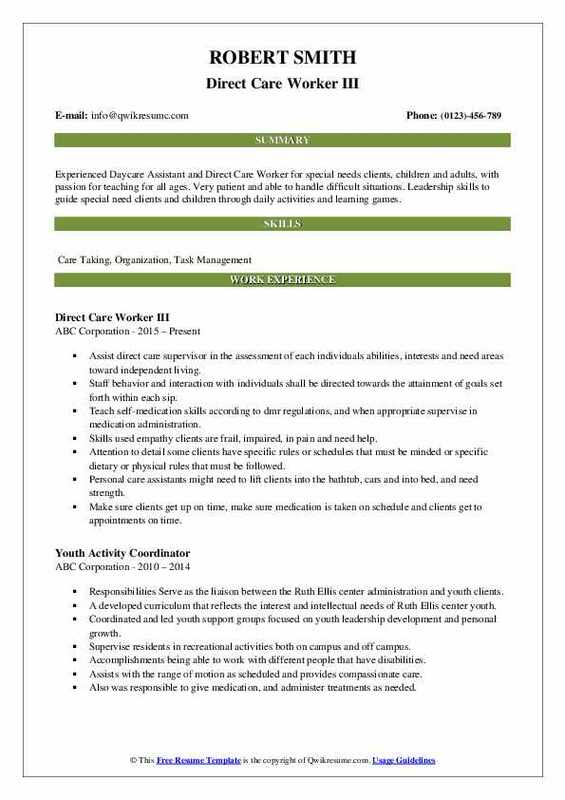 Summary : Experienced Daycare Assistant and Direct Care Worker for special needs clients, children and adults, with passion for teaching for all ages. Very patient and able to handle difficult situations. Leadership skills to guide special need clients and children through daily activities and learning games. Assist direct care supervisor in the assessment of each individuals abilities, interests and need areas toward independent living. Staff behavior and interaction with individuals shall be directed towards the attainment of goals set forth within each sip. Teach self-medication skills according to dmr regulations, and when appropriate supervise in medication administration. Skills used empathy: clients are frail, impaired, in pain and need help. Attention to detail: some clients have specific rules or schedules that must be minded or specific dietary or physical rules that must be followed. Personal care assistants might need to lift clients into the bathtub, cars and into bed, and need strength. Make sure clients get up on time, make sure medication is taken on schedule and clients get to appointments on time. Objective : A dedicated and compassionate nurse with a broad range of healthcare experience in clinical and home settings providing patient care. An opportunity to obtain a position that will utilize my skills and help me to achieve my goals. Collects patient specimens and data, including vital signs, input/output, and other delegated measurements. Answered call lights and aided in patient comfort and safety by adjusting beds, lights, bed rails, pillows, patients clothing and bedside tables/equipment. 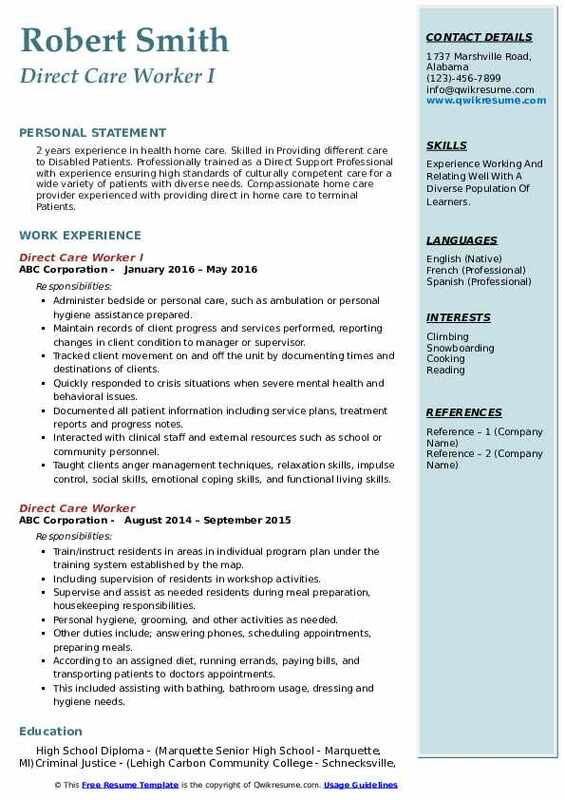 Objective : 2 years experience in health home care. Skilled in Providing different care to Disabled Patients. Professionally trained as a Direct Support Professional with experience ensuring high standards of culturally competent care for a wide variety of patients with diverse needs. Compassionate home care provider experienced with providing direct in home care to terminal Patients. Skills : Experience Working And Relating Well With A Diverse Population Of Learners. Administer bedside or personal care, such as ambulation or personal hygiene assistance prepared. Maintain records of client progress and services performed, reporting changes in client condition to manager or supervisor. Quickly responded to crisis situations when severe mental health and behavioral issues. Interacted with clinical staff and external resources such as school or community personnel. Taught clients anger management techniques, relaxation skills, impulse control, social skills, emotional coping skills, and functional living skills. Assisted clients in scheduling home visits and phone calls monitored the effectiveness of these activities. Administer medication to patients presenting a serious risk of danger to themselves and others. Summary : Highly-motivated and upbeat individual with 8+ years' professional work experience of managing general office operations. Demonstrated expertise in performing a diverse range of front desk tasks. Great people skills with a profound ability to handle multiple tasks simultaneously. Transported patients to treatment units, using a wheelchair and stretcher. Observed patients conditions, measuring and recording food and liquid intake and output and vital signs, and reported changes to professional staff. Provided patient care by supplying and emptying bedpans, applying dressings and supervising exercise routines. Provided patients with help walking, exercising, and moving in and out of bed. Bathed, groomed, shaved, dressed, and draped patients to prepare them for surgery, treatment, and examination. Turned and re-positioned bedridden patients, alone and with assistance, to prevent bedsores. Maintained inventory by storing, preparing, sterilizing, and issuing supplies such as dressing packs and treatment trays. Headline : Level-headed Direct Care Worker who remains calm and effective in extremely difficult and stressful situations. Strong belief in importance of companionship and support in patient care. Performed direct patient care aimed at increasing comfort, psycho, social and spiritual well- being by providing assistance with personal hygiene, physical comfort, nutrition, elimination, prevention of skin breakdown, rehabilitation and safety. Summary : To build a long-term career with opportunities for career growth using my skills in the best possible way for achieving company goals. 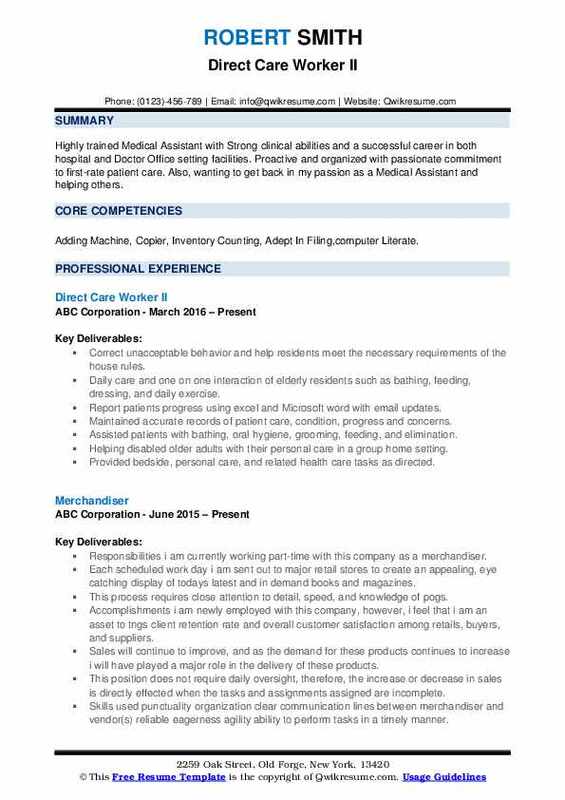 To obtain a career with an organization that will benefit from my unique skills and talents. 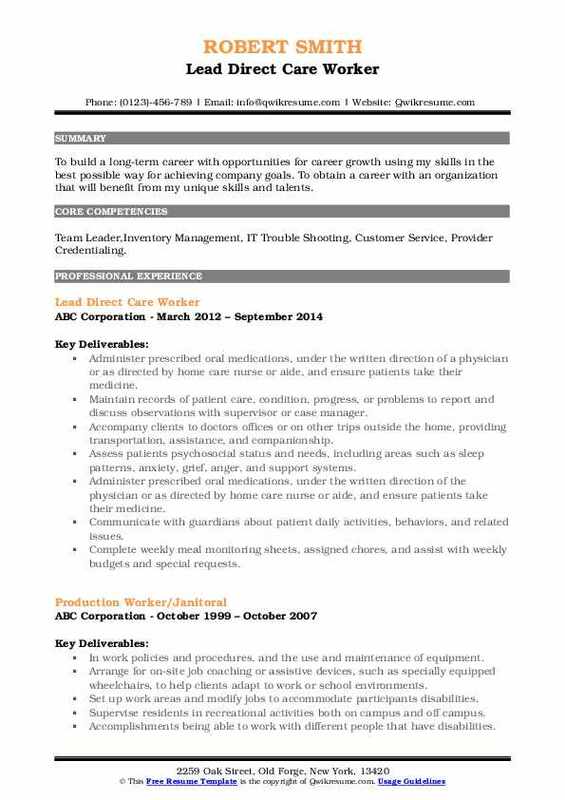 Skills : Team Leader,Inventory Management, IT Trouble Shooting, Customer Service, Provider Credentialing. Administer prescribed oral medications, under the written direction of a physician or as directed by home care nurse or aide, and ensure patients take their medicine. Accompany clients to doctors offices or on other trips outside the home, providing transportation, assistance, and companionship. Assess patients psychosocial status and needs, including areas such as sleep patterns, anxiety, grief, anger, and support systems. Administer prescribed oral medications, under the written direction of the physician or as directed by home care nurse or aide, and ensure patients take their medicine. Communicate with guardians about patient daily activities, behaviors, and related issues. Complete weekly meal monitoring sheets, assigned chores, and assist with weekly budgets and special requests. 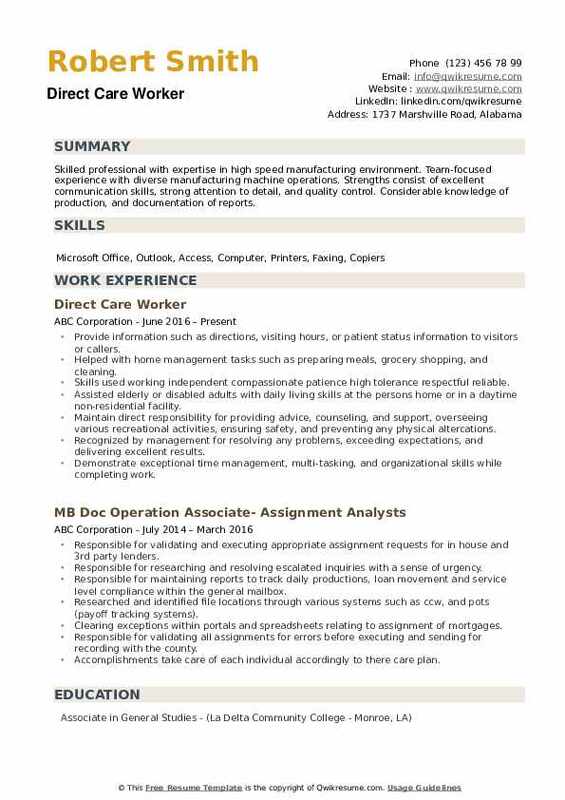 Objective : Reliable and honest Medical Assistant/Direct Care Worker dedicated to providing excellent care to patients/residents in a helpful and professional manner to enhance the services provided within a medical facility or group home and contribute to team success using great communication skills and a strong work ethic. Direct care workers give assistance to people who are sick, injured, mentally or physically disabled, or the elderly and fragile. Reported in writing any problems on the job or any suggestions to the consumer's service plan. Prepped and passed medications, when appropriately supervised in medication administration. Assist with personal care such as hygiene, laundry, food preparation, and light housekeeping. Identify and provide additional assistance/support as needed to ensure efficient operations and positive outcomes. Assisted elderly or disabled adults with daily living skills at the person's home or in a daytime non-residential facility. Assistance with scheduling medical appointments and ordering medical supplies if needed. Objective : Skilled professional with expertise in high speed manufacturing environment. Team-focused experience with diverse manufacturing machine operations. Strengths consist of excellent communication skills, strong attention to detail, and quality control. Considerable knowledge of production, and documentation of reports. Helped with home management tasks such as preparing meals, grocery shopping, and cleaning. Skills used working independent compassionate patience high tolerance respectful reliable. Maintain direct responsibility for providing advice, counseling, and support, overseeing various recreational activities, ensuring safety, and preventing any physical altercations. Recognized by management for resolving any problems, exceeding expectations, and delivering excellent results. Demonstrate exceptional time management, multi-tasking, and organizational skills while completing work.